We’ve been waiting for you, rockfish. We meet again, at last. You might wonder why scientists need to know the location and population densities of rockfish in the Channel Islands National Marine Sanctuary. Well, rockfish are tasty and commercially important, plus they are an important component of healthy marine ecosystems. To estimate how many there are and where they’re at, you’ll need lots of equipment and fisheries biologist, Fabio Campanella. Fabio Campanella and Julia Gorton getting some fresh air. Breaks are important to help them stay on target. Monitor showing the EK60 in action. Your eyes can deceive you…watch out for the acoustic dead zone! First, let’s start with the equipment. Shimada has an EK60, which is essentially a fish finder: the computer’s transducer sends out sonic “pings” that become a single acoustic “beam” in the water. It covers about 7° at one time, so think of it as taking a cross section of the water column. The beam bounces off any solid object in the water and returns to the transducer. 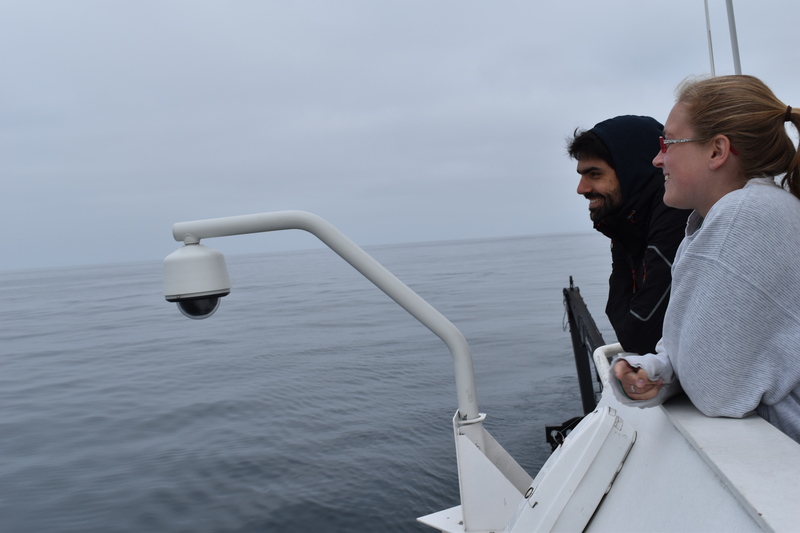 The size and composition of the object it hits will affect the quality of the returning pings, which allows Fabio to discern between seafloor, small plankton, and larger fish, as well as their location in the water column. One drawback of this system is the existence of an acoustic dead zone, which is an area extending above the seafloor where fish cannot be detected (think of them as sonar blind spots). Do. Or do not. There is no try. Fabio Campanella hard at work in Shimada‘s Acoustic Lab. It’s a trap! Nope, it’s a starry rockfish (Sebastes constellatus) found in the CINMS. Ideally, acoustic data collection is done simultaneously with ground truthing data. Ground truthing is a way to verify what you’re seeing. 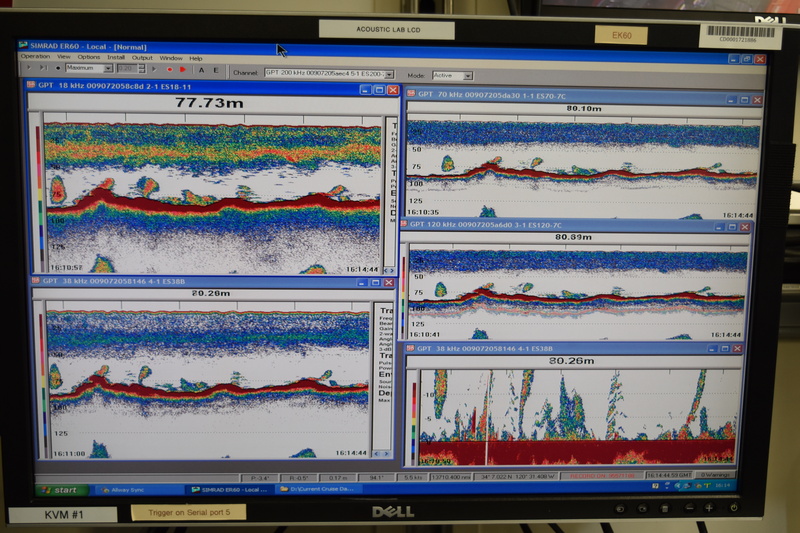 If you think the EK60 is showing you a school of herring, you can run nets or trawls to verify. If it’s in an area that is untrawlable, you can use ROVs or stationary cameras to identify fish species and habitat type. Species distribution maps are also useful to have when determining possible fish species. EK60 data shown on the bottom; ME70 data on top right; 3-D visualization of the school on the top left. Witness the power of this fully operational Echoview software. 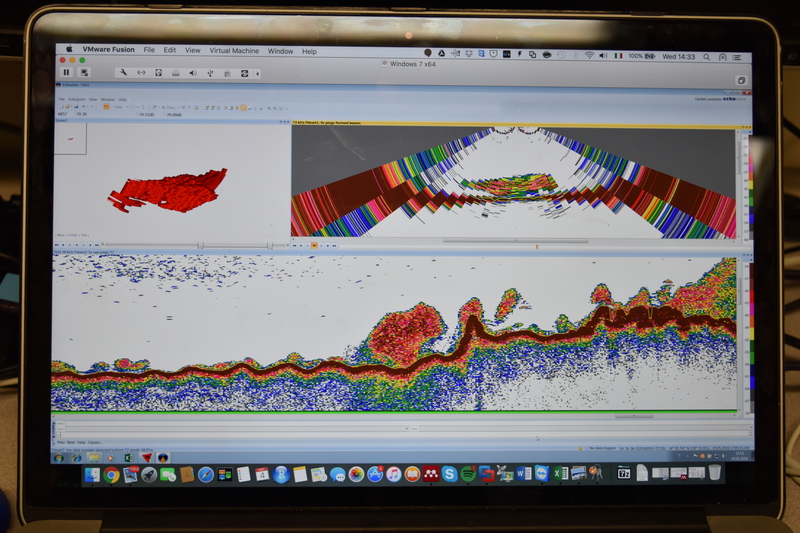 If Fabio finds something especially interesting on the EK60, such as a large school of fish, he can refer to the data simultaneously collected by the ME70 multibeam sonar to get a more detailed 3-D image. Since the ME70 uses multiple beams and collects 60 degrees of data, he can use it to (usually) get a clear picture of the size and shape of the school, helping him identify fish species and density. 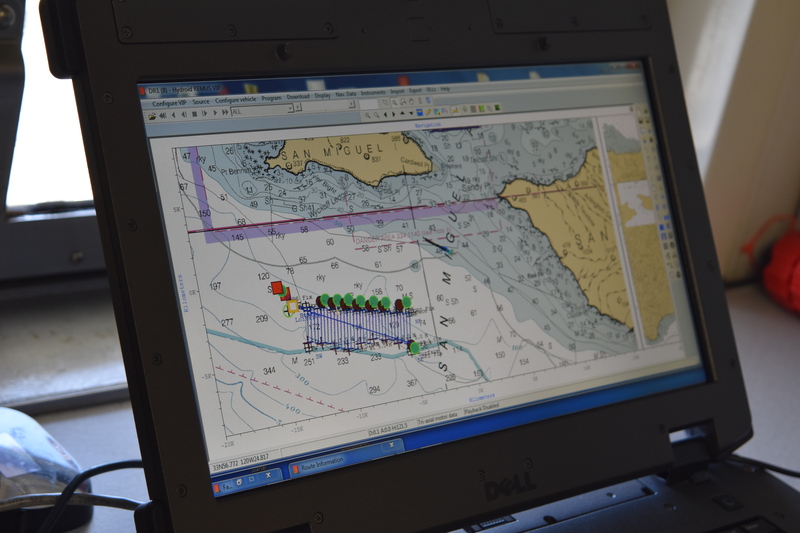 So why does he use the EK60 first if there is so much more data provided by the multibeam? 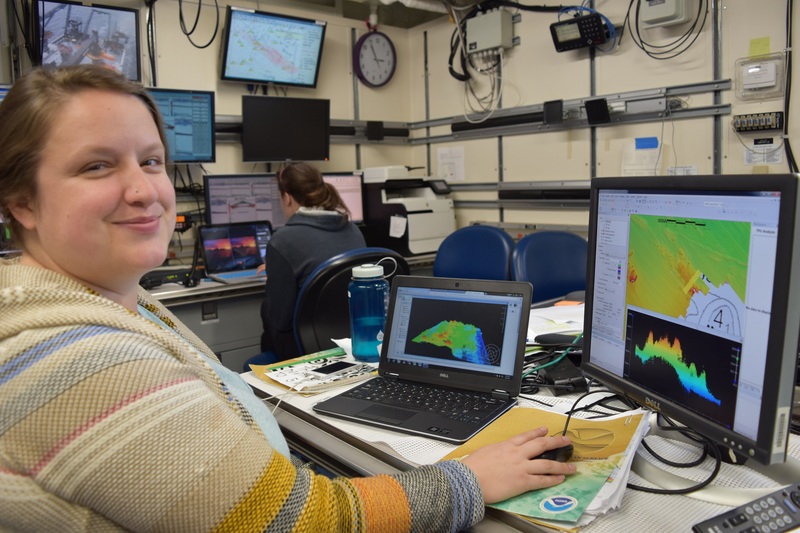 Well, the amount of data provided by the ME70 is incredibly overwhelming; it would take weeks of data analysis to cover just a tiny section of the marine sanctuary. 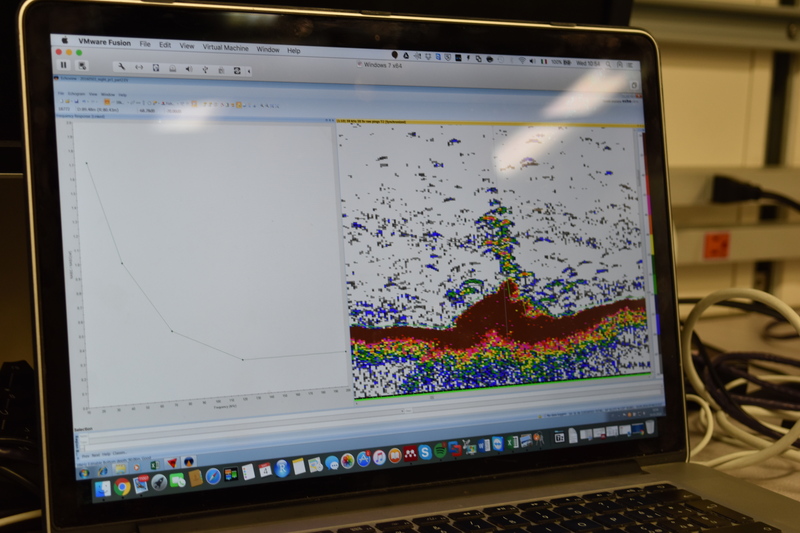 By using the EK60 to cover large areas and the ME70 to review small areas of specific interest, he is able to create fish distribution and density maps for the largest areas possible. 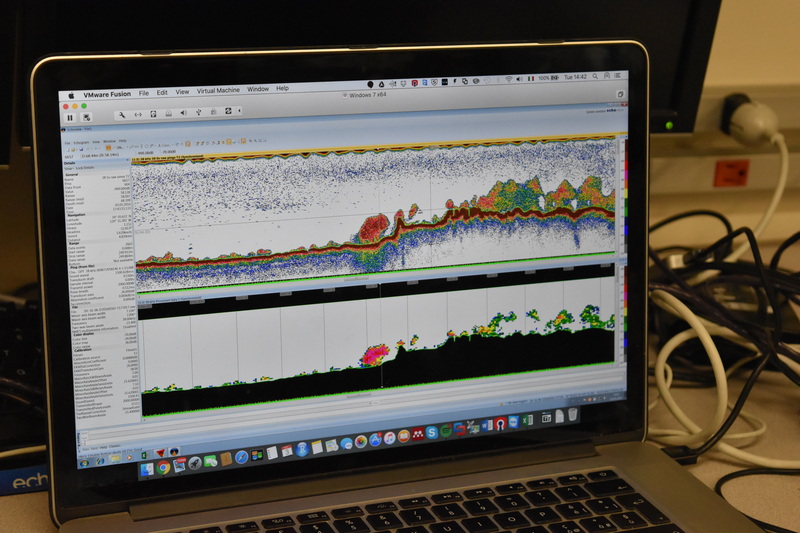 After collecting data from the two sonars, it needs to be processed. 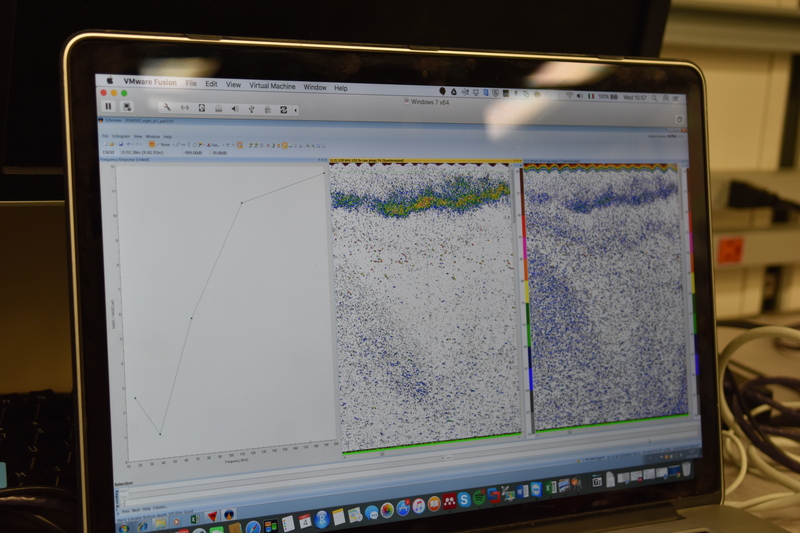 The method you use to process the data depends on your goal: biomass, population densities, and fish locations are all processed differently. 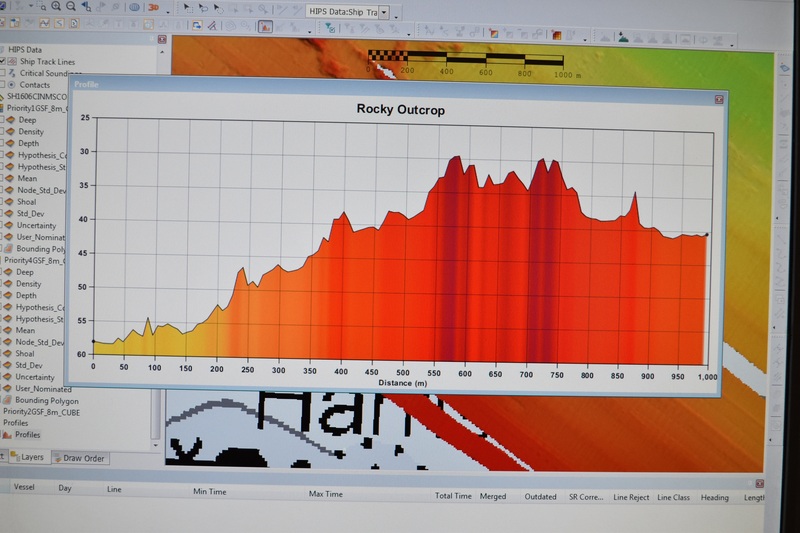 Since rockfish are found close to hard, rocky seafloor, data analysis becomes quite complicated, as it becomes difficult to discriminate the fish from the seafloor. Hard bottoms also introduce a lot of bias to the data; for these, and other, reasons there are very few hard bottom studies for Fabio to refer to. Cleaned data. I’ve got a good feeling about this. But back to the data analysis. Once data is collected, it is loaded into Echoview software. 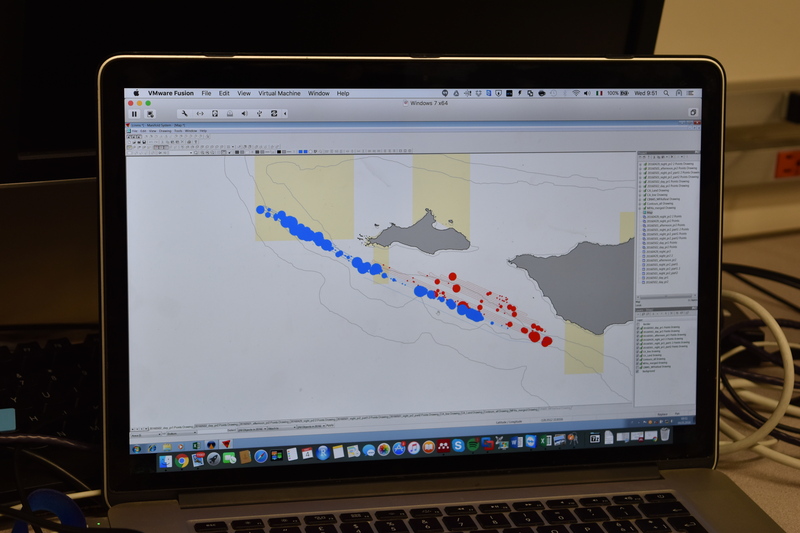 Fabio then removes the background noise coming from other equipment, averages the data to reduce variability, and manually modifies the seafloor line (rocky bottoms with lots of pinnacles give incorrect bottom data). This last step is crucial in this mission because the focus is on rockfish who live close to the bottom. School of fish shown on the right of the screen and the frequency response shown on the left. Fish are not lost today. They are found. The clean echogram is then filtered for frequencies falling in the suitable range for fish with swimbladders (a gas-filled organ used to control their buoyancy). Object with a flat response at all frequencies (or slightly higher at low frequencies) will most likely be fish with swimbladders, whereas a high response to high frequencies will most likely not be fish (but it could be krill, for example). Once Fabio has made the final fish-only echogram, he exports the backscatter and uses it to create biomass or density estimates. All of these steps are necessary to complete the final product: a map showing where rockfish fish are in relation to the habitat. Krill shown on the right and frequency response shown on the left. Judge them by their size, we do. The final product. When making accurate maps of rockfish, there is no such thing as luck. It seems I overpacked sunscreen…12 hours of my day are spent in the acoustics lab staring at monitors, with brief breaks every so often to look for whales and other wildlife. This mission is so technical. I am grateful for the hours spent asking the scientists questions and having them explain the details of their work. Lately, the big screen TV in the lab has been turned on with some great movies playing. So far we’ve watched, Zootopia, Deadpool, LoTR, and, of course, The Force Awakens. May the 4th be with you…always. Word of the Day: Holiday. A holiday is an area in your bathymetry map that does not include any data (think of it as “holes in your data”). It’s like you’ve painted a picture, but left a blank splotch on your canvas. There is a lot of amazing equipment on board Shimada, but my favorite, by far, is the REMUS 600 AUV. Really, it should be everyone’s favorite. 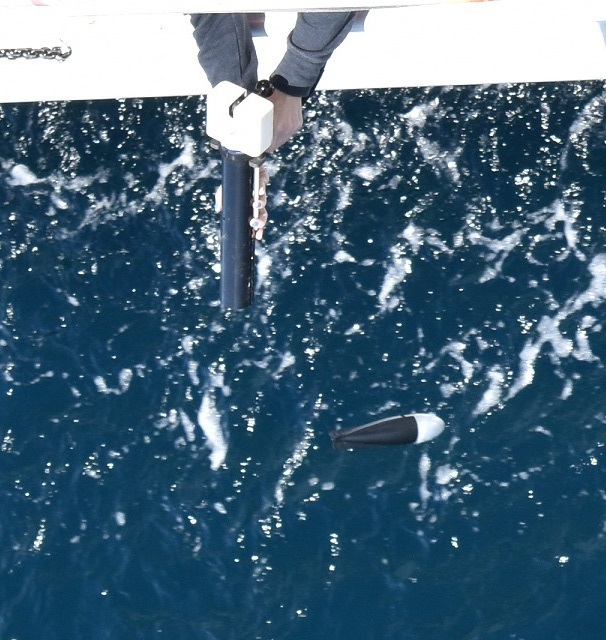 What other piece of equipment can you release in the middle of the ocean, have it swim around for a few hours collecting data, then have it ready and waiting for you in the morning? I’m pretty sure my laptop wouldn’t be able to do that if I threw it overboard (although, on a few occasions, I’ve been tempted to try). 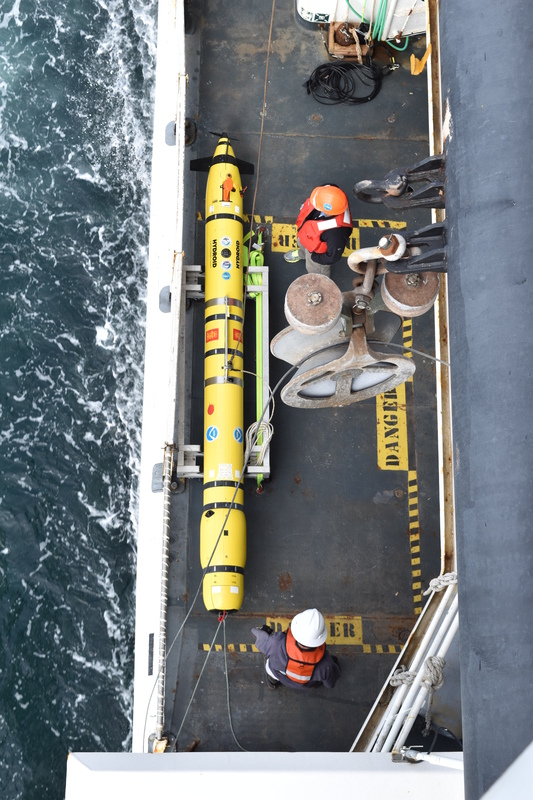 On Shimada’s mission, the AUV is used when scientists need detailed, high-resolution imaging of deep water areas or areas of special interest. 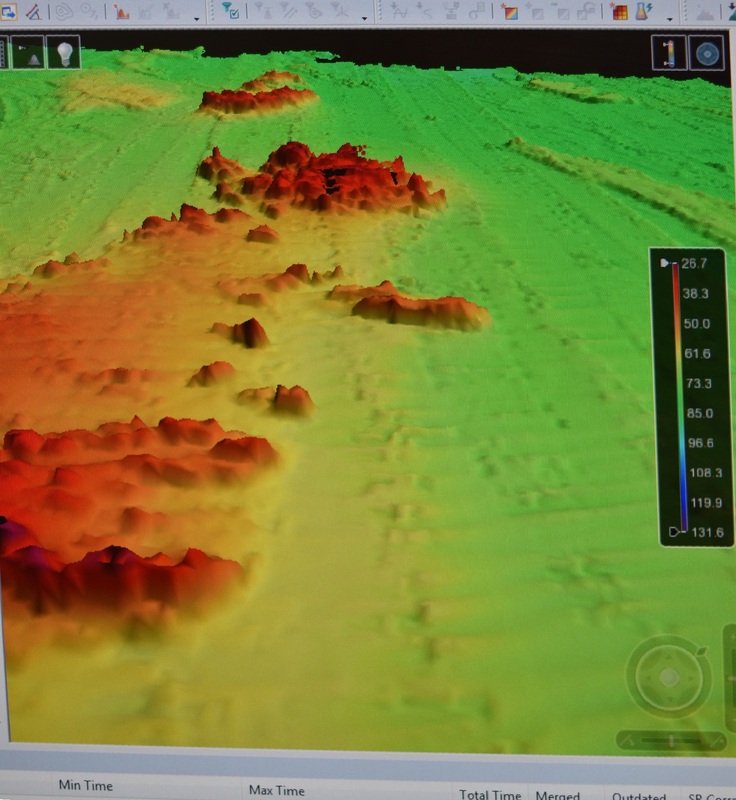 The ship’s ME70 multibeam sonar can map the seafloor up to 350m deep, whereas the AUV can map as far down as 400m. Now remember, this is an AUTONOMOUS Underwater Vehicle; this means that you are literally dropping it off the side of the boat, leaving it to propel itself along a pre-programmed route, then, hours later, returning to a set location with the hope of seeing your million-dollar robot pop back up to the surface to be retrieved. The AUV has returned to the Shimada! There is a lot that needs to go right in order for this to happen. In the REMUS 600, there are three separate systems that must all function correctly in order to successfully complete its mission. The navigational system includes an Inertial Measurement Unit (IMU) for pitch, roll, and heading compensation, a Doppler Velocity Log (DVL) for speed over land measurements, GPS for location, and processing software. 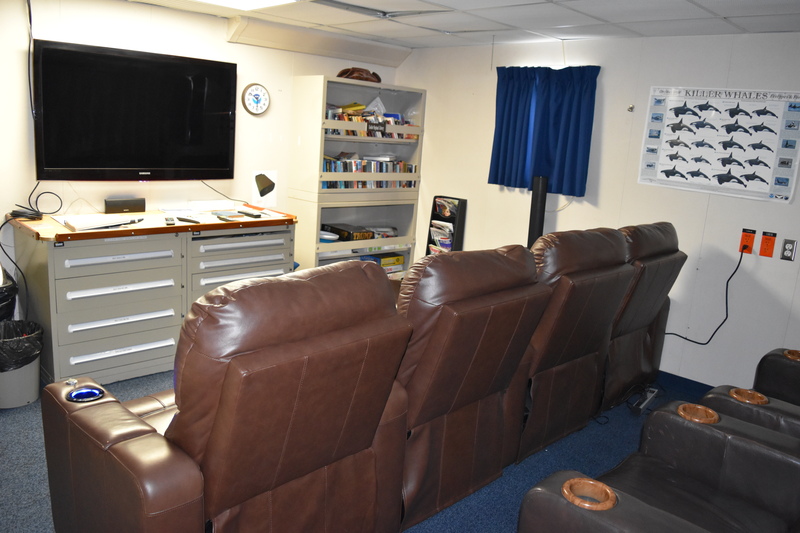 The communication system includes a micromodem to receive status messages while AUV is up to 1500m away, an Iridium satellite communications system, and, of course, Wi-Fi. The sensors include multibeam sonar, obstacle avoidance sonar, a depth sensor, and a CT (conductivity, temperature) sensor to analyze sound speed for beam formation. If these systems aren’t working correctly, there’s a good chance you’ll never see this AUV again (which would make a lot of people very unhappy). 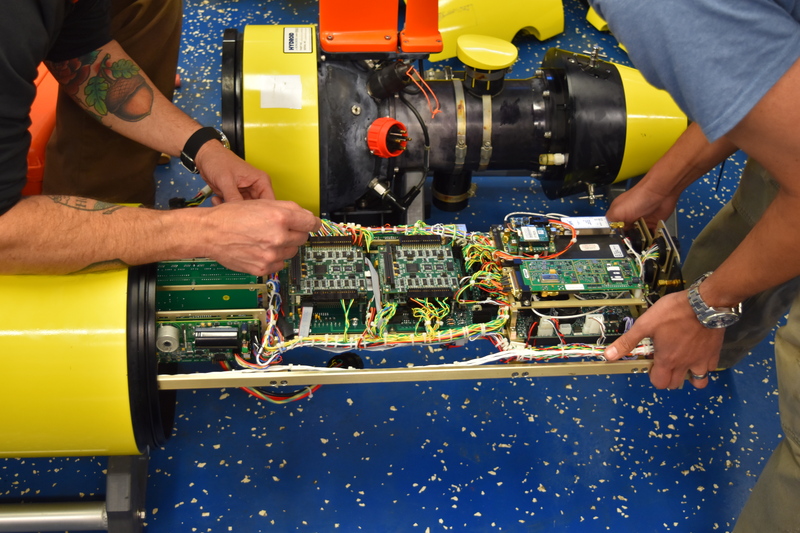 Basically, all these systems ensure that the AUV stays at a specific height above the seafloor (around 75m), runs a specific course that you programmed, and collects data for you to analyze when it returns. 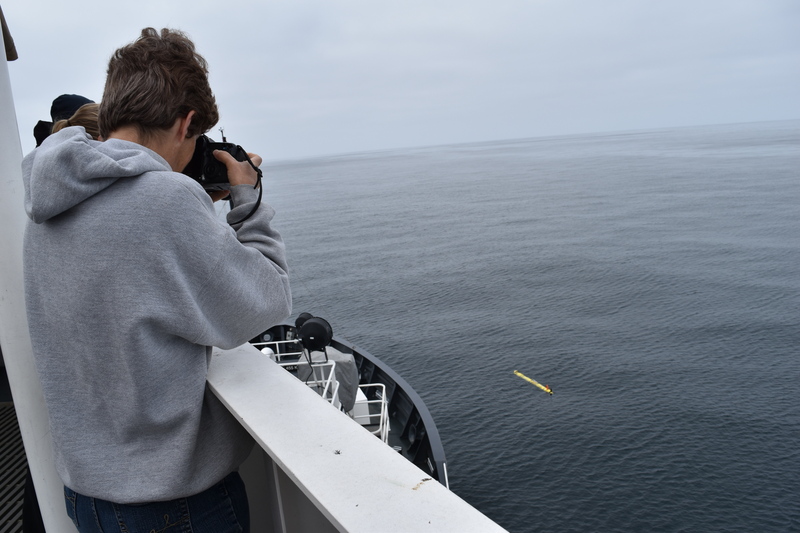 Every hour or so while it’s running its course, the AUV rises to the surface, makes a satellite phone call to check in with Shimada, then goes back down to continue its data collection. When it’s done with its course, it runs in circles (think underwater donuts) until the ship returns and the scientists call it back up to the surface where it can be retrieved. 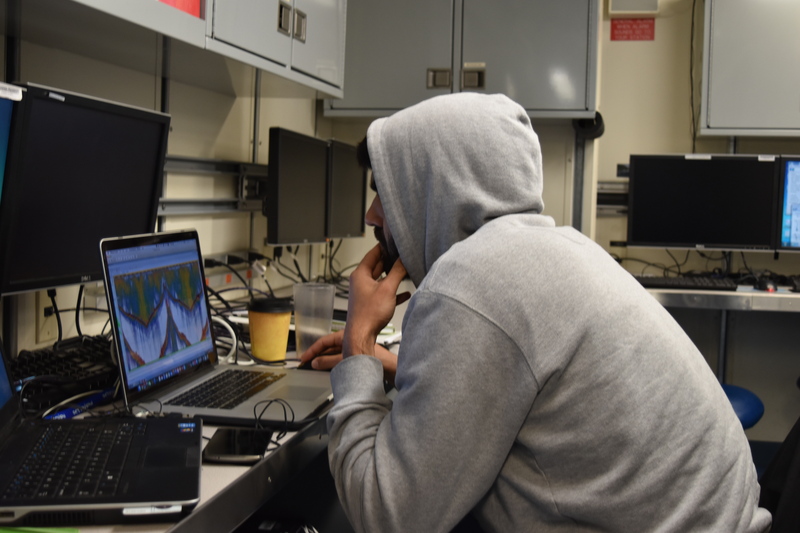 Remember how I said that all the systems must be working correctly in order for the AUV to successfully complete its mission? Well, this first launch and retrieval went off without a hitch, but it turns out something went wrong with the data collection (as in, there were no data collected after the first 45 minutes). The scientists are once again on the phone with customer support to try to figure out what went wrong. 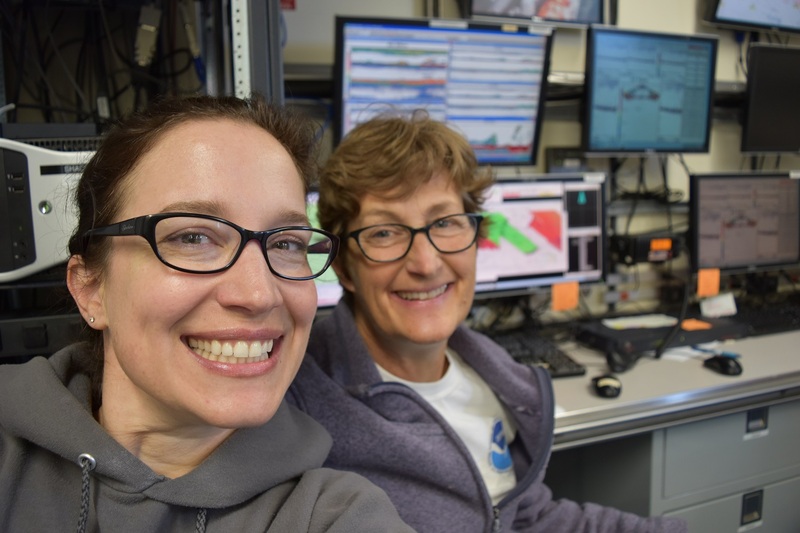 On the bright side, there are far worse things that could have gone wrong: the AUV successfully ran its course, checked in with the ship, and came up to the surface at the time and place it was supposed to. That doesn’t always happen, which is why the AUV has an “If found, please call this number” sticker right on top of it. Just like what’s written on your retainer case…except your retainer didn’t cost one million dollars. Even though it seems like the hours are filled with troubleshooting and problem solving, there are still many things going our way. 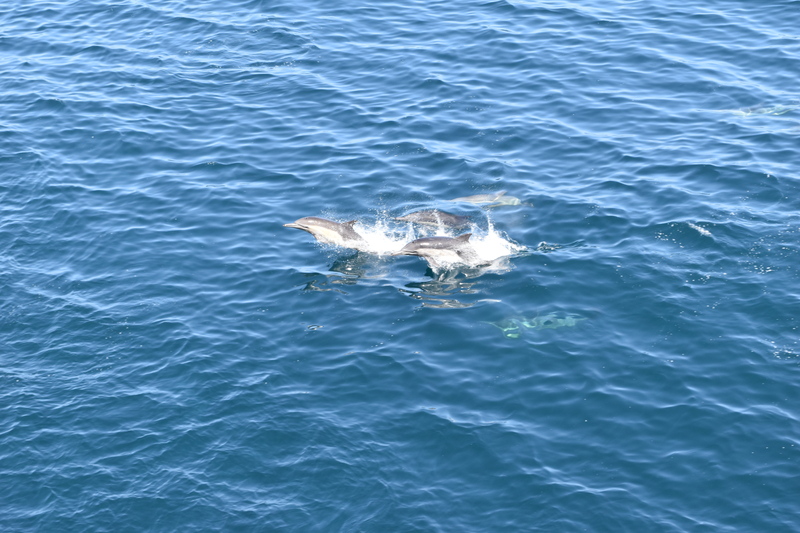 The ME70 and EK60 have been successfully running all day, the weather is fully cooperating with calm seas and beautiful skies, and, last but not least, dolphins decided to play right next to the ship. Bring on tomorrow! Dolphins around San Miguel Island. Always a crowd pleaser! Words of the Day: AUVs and ROVs. Autonomous Underwater Vehicles are pre-programmed and complete their mission without supervision. Remotely Operated Vehicles are connected to the ship by a cable and are directly controlled by a human operator. Ah, technology! Nothing illuminates the darkness of ignorance like these modern marvels of human innovation. Except, of course, when they aren’t working correctly…which is where we find ourselves on day three of the mission. But I’m getting ahead of myself. 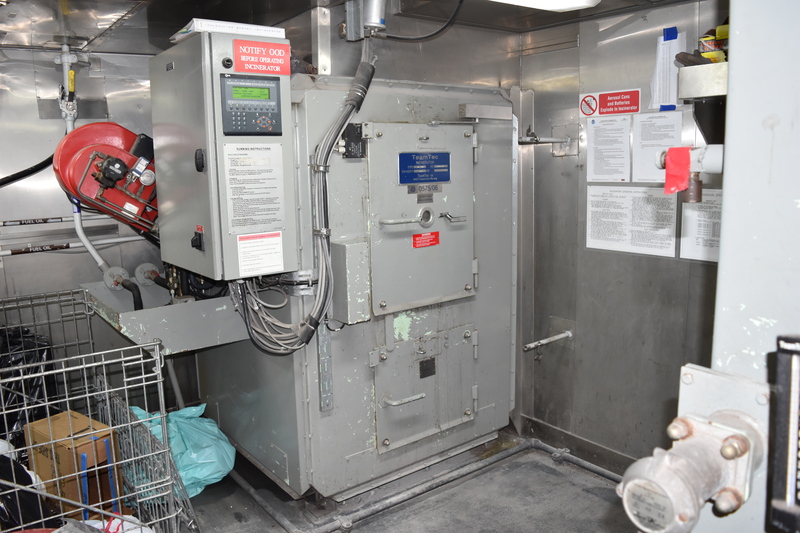 Let’s start with a review of what the Shimada is doing and why the mission is so important. If you were a biologist studying mountain lions, you would have a pretty good understanding of where they might be found. You could refer to detailed range and habitat maps and would be able to make management decisions based on some pretty accurate information. Now, let’s say you are a marine biologist studying sharks around the Channel Islands. Your sharks prefer a sandy seafloor, so you pull up a map that has these areas identified…oh, wait, a map like this doesn’t exist. 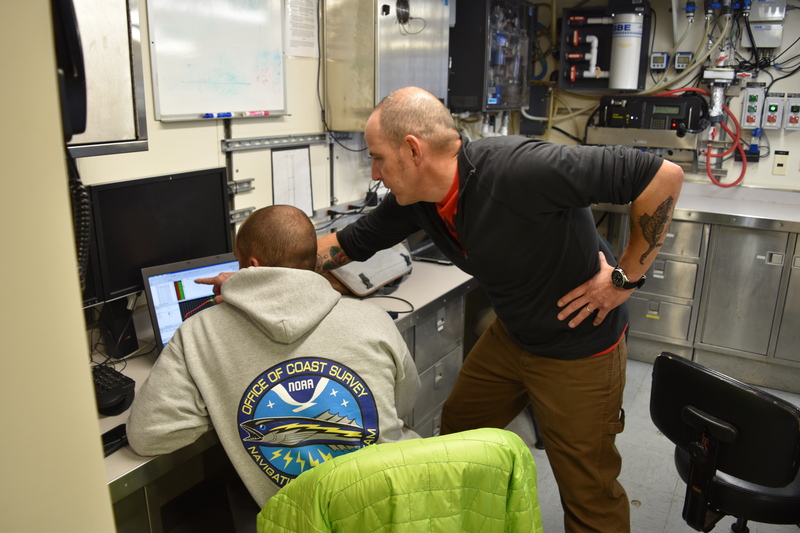 Perhaps you work for the US Navy and would like to lay down a cable with the least amount of habitat damage, so you pull up a map that identifies fragile, deep sea coral habitat…oh, wait, that doesn’t exist, either! Most of us know the importance of terrestrial topographic, habitat, and species range maps, yet in many marine ecosystems, such as the Channel Islands National Marine Sanctuary, these data are virtually nonexistent. How crazy to think that we don’t even have information critical to making numerous important decisions! For example, this information is crucial to creating safe navigational routes, placement of pipes and cables, and locations of key fish habitats. This is why the Shimada’s mission of mapping areas around the Channel Islands is so important. the two systems so that both can collect data at the same time. Finally, the AUV has not yet been deployed because of bad weather (not because it cannot be deployed, but because it would be difficult to retrieve). Monday’s forecast, however, looks very promising, so stay tuned to see how these issues resolve! I am constantly awed by the amount of teamwork required to complete a scientific mission such as this. 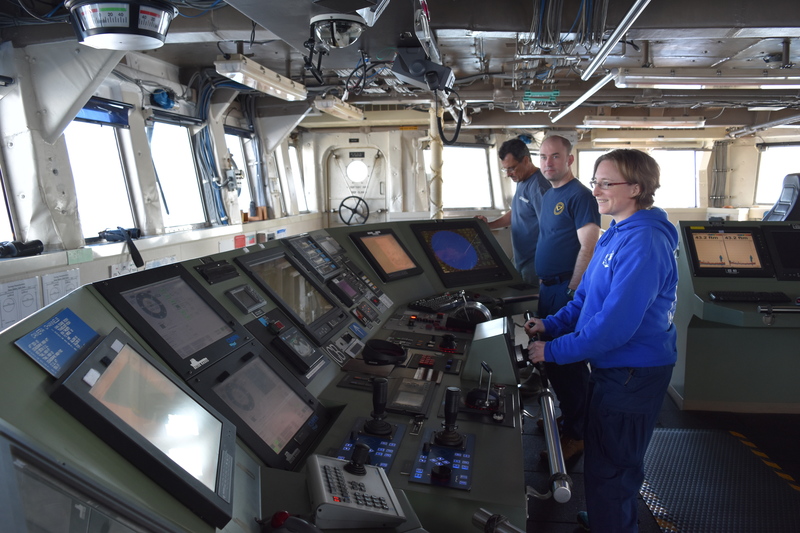 The diversity of duties and expertise of the people involved is mind-boggling: everyone from a ship steward to the Chief Scientist has a crucial role to play and, without each, the mission would fall apart. 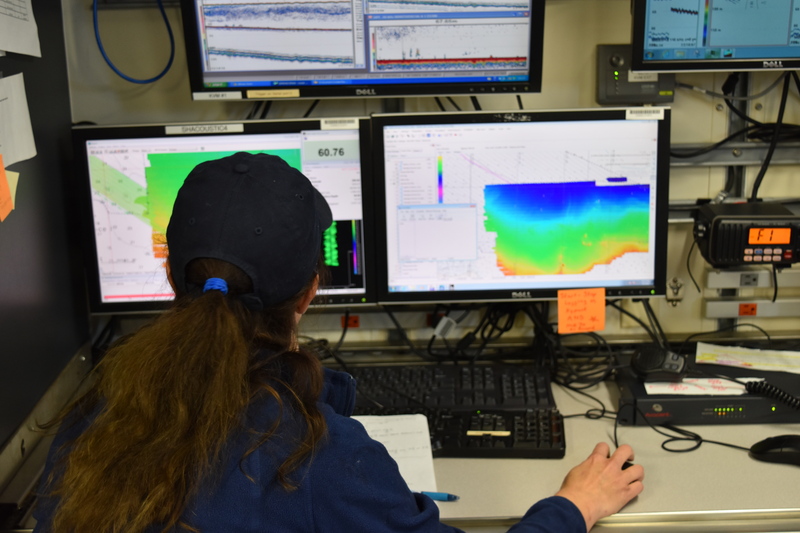 For example, the scientific team consists of hydrographers, AUV operators, marine biologists, and physical scientists. 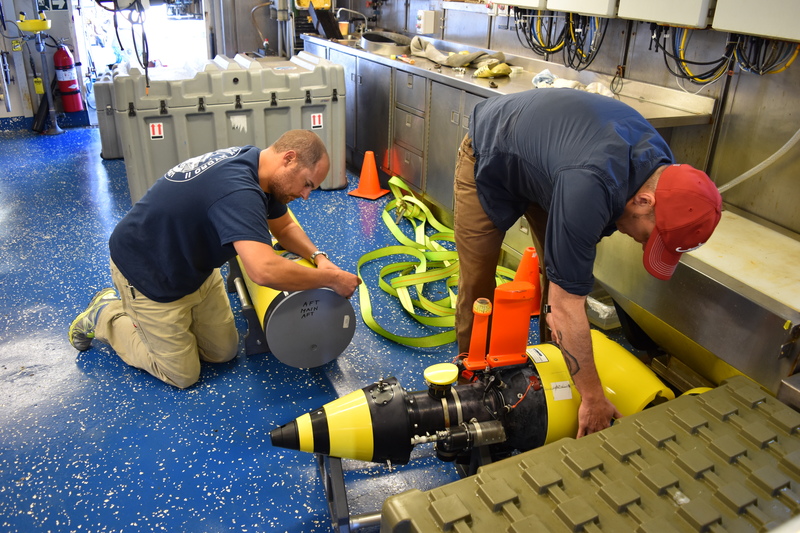 The ship’s crew consists of NOAA Corps officers, engineers, deck, stewards, and survey crew. Each person has their specialty, yet everyone has to work together to solve the inevitable problems that arise. Finally, I suppose I should mention the crazy weather we had on our first day at sea. The San Francisco Bay was beautiful, but as soon as we passed under the Golden Gate Bridge, the waves grew larger and the passengers began to turn various shades of green. Even though I don’t usually get seasick, I took Dramamine just in case (which, as the swells reaches 15-20 feet, turned out to be a very wise decision). I spent a couple of hours on the bridge riding nature’s finest roller coaster, then turned in for the night and slept 11 hours. What a way to start a mission! The Channel Islands National Marine Sanctuary was designated in 1980 and encompasses 1470 square miles. Bathymetry is the measurement of the depths of large bodies of water, including the oceans, rivers, streams, and lakes. Stardate 8130: Well, not really, but isn’t that the way all logs should start? My name is Nichia Huxtable and I teach biology at Fillmore High School in beautiful Ventura County. Fillmore is a wonderful small town with a rich agricultural history and a picturesque downtown. The best part about Fillmore, however, is the absolutely amazing students that I have the pleasure of working with every day. They are friendly, curious, polite, and funny, and are the reason why I am participating this NOAA expedition. So, you ask, how can a teacher participating in a research expedition benefit the students? Are you taking them with you? Ah, good question! No, I am not taking them with me, although they will be joining me in spirit. First, I will need to learn. 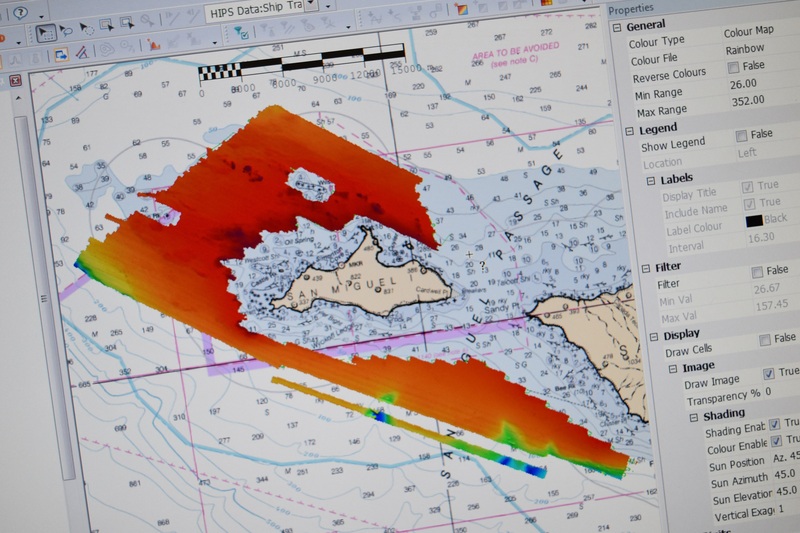 The mission of this trip is to create high resolution maps of sections of the Channel Islands National Marine Sanctuary (CINMS). We will be using scientific equipment and techniques that I never even knew existed and I will be interviewing the scientists and crew members to get a better understanding of who they are and what they do. 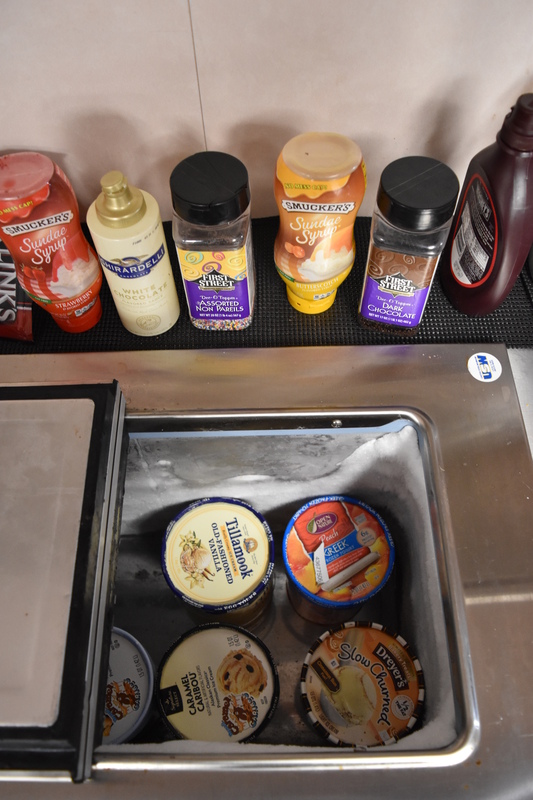 The whole time I will be posting updates and pictures on this very blog, so be sure to check back often! Second, when I return to Fillmore, I’ll use my newly acquired knowledge to develop classroom lessons that will bring this amazing science back to my students. 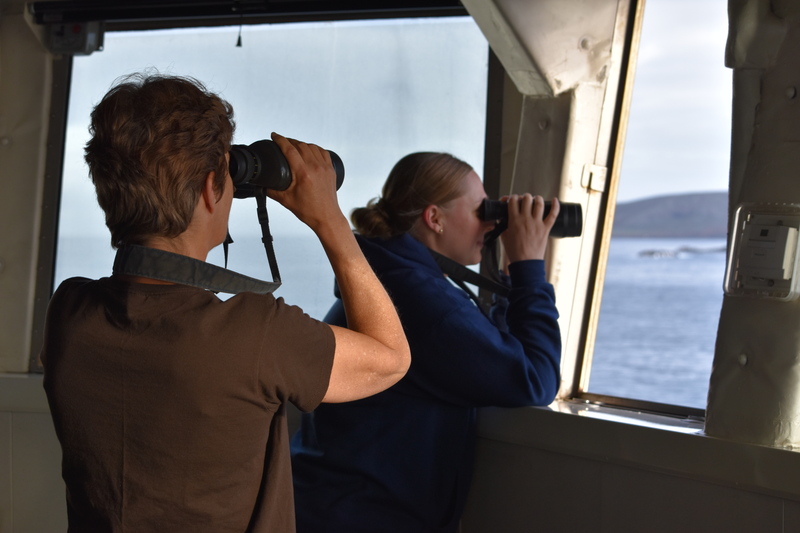 These lessons will revolve around three learning goals: 1) the ecological importance of marine sanctuaries, 2) methods scientists use to collect, analyze, and share data, and 3) exposure to new career pathways and possibilities. In order to reach as many students as possible, these lessons and activities will also be shared with other teachers in my district and, in fact, any teacher who would like them. I cannot even explain how excited I am to participate in this research trip! My background is in wildlife biology, so while I have plenty of experience with kangaroo rat and leopard lizard surveys, I am far less familiar with the science of oceanography. The next time you see me, I will be in the middle of the Pacific Ocean helping to identify what’s under the water surrounding the Channel Islands. See you then! PS- Please be sure to check the links to the Ship and the Channel Islands National Marine Sanctuary!